The ACRL-Oregon Award for Excellence is a project-based award given annually to an individual or group whose project or initiative has significantly improved Oregon academic libraries or librarianship. We are proud to announce this year’s award winner, John Schoppert, Director of Library Services at Columbia Gorge Community College (CGCC), for leading the Gorge Open (GO) Open Educational Resources (OER) project. 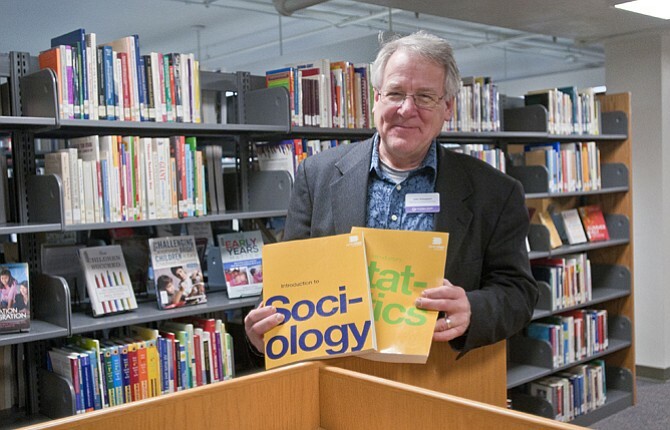 John Schoppert holds Open Source textbooks used at Columbia Gorge Community College. Photo by Mark Gibson, The Dalles Chronicle, 2015. Click photo for original source and related article. Mr. Schoppert collaborated with CGCC administration, the distance learning coordinator, faculty, the bookstore manager, and advisors, and he sought the support of the CGCC Foundation. He designed an outreach program for faculty, which included seminars and presentations to departments, committees, and one-on-one consultations. These efforts helped raise the awareness of OER throughout the campus and created a groundswell of interest, which led to early adoption of OER into course curriculum. Mr. Schoppert helped instructors integrate OER into the classroom, provided research support, and designed course assessments to improve the instructional design and to address student concerns about the OER alternative textbook program. Furthermore, Mr. Schoppert kept institutional interest high by engaging the administration, the board of education, and staff shareholders (the bookstore manager, advisors, etc.) and including them in the efforts of building OER courses. By engaging the administration, Mr. Schoppert created an overall awareness of OER, not only as it affected CGCC students, but also through connecting it to student success nationwide by alleviating burdensome textbook costs. By repeated presentations to administration, the board, and to the CGCC Foundation for financial support, the CGCC OER program was firmly established on the institutional level and integrated into the Student Success Plan and the Strategic Enrollment Management Plan, the two overarching management plans for CGCC student success. The final goal for Mr. Schoppert was to brand the OER program, and give OER classes a clear distinction in the CGCC schedule. Thus was born the GO – “Gorge Open” – brand icon, which corresponds with every course that uses OER each term. This icon allows student to know which courses would reduce their college expenses by not using a publisher’s textbook. Although somewhat controversial, it has proven effective as students are increasingly signing up for these classes. As early adopters of using an OER icon in their schedules, CGCC was pleased to see the recent passage of Oregon House Bill 81 – the OER bill – which included the requirement of an icon in community college schedules to designate OER courses, along with the funding for OER adoption throughout the state. To date, CGCC has saved students over $61,000 in student textbook costs. Congratulations again to John Schoppert, recipient of the 2015 ACRL-Oregon Award for Excellence! Please visit the Award for Excellence page for more info about the award, as well as for a list of past winners and projects.